May 13th, 2010 by Roy W. Spencer, Ph. D.
Edited 1:35 p.m. CDT 5/13/10: Trivia question added, at the end of the post. 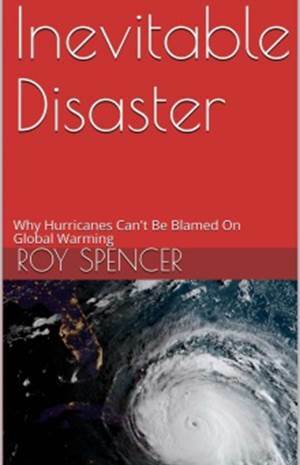 Despite its relative simplicity, I continue to find myself trying to explain to experts and lay persons alike how scientists made the Great Global Warming Blunder when it comes to predictions of global warming. 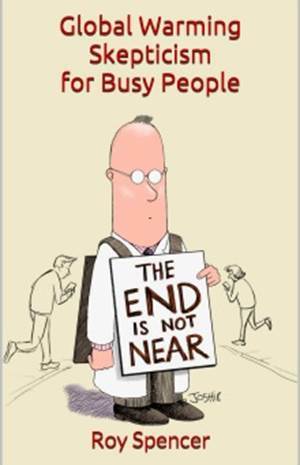 On the bright side, this morning I received an e-mail from a chemist who looked at the math of the problem after reading my new book, and then came to the understanding on his own. And that’s great! For the most part, though, the climate community continues to suffer from a mental block when it comes to the true role of clouds in global warming. All climate models now change clouds with CO2 warming in ways that amplify that warming, some by a catastrophic amount. 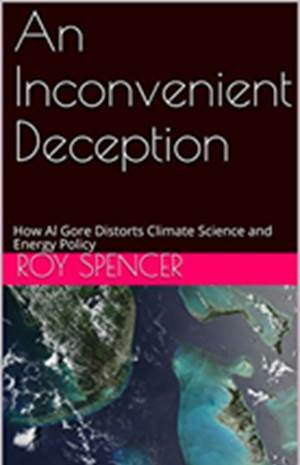 As my latest book describes, I contend that they have been fooled by Mother Nature, and that in fact warming alters clouds in ways that mitigate – not amplify — the small amount of direct warming caused by increasing atmospheric CO2. The difference between clouds magnifying versus mitigating warming could be the difference between global warming being little more than an academic curiosity…or a disaster for life on Earth. So, once again I find myself trying to explain a concept that I find the public understands better than the climate experts do: when it comes to clouds and temperature, the direction of causation really does matter. Why Are There Fewer Clouds when it is Warm? The “scientific consensus” has been that, because unusually warm conditions are observed to be accompanied by less cloud cover, warming obviously causes cloud cover to decrease. This would be bad news, since decreasing cloud cover in response to warming would let more sunlight in, and amplify the initial warming. That’s called positive cloud feedback. But what they have difficulty understanding is that causation in the opposite direction (cloud changes causing temperature changes) gives the ILLUSION of positive cloud feedback. It turns out that, when less cloud cover causes warmer temperatures, the cloud feedback in response to that warming is almost totally obscured. Believe it, the experts have not accounted for this effect. I find it bizarre that most are not even aware it is an issue! As far as I know, I am the only one actively researching the issue. As a result, the experts have fooled themselves into believing cloud feedbacks are positive. We have demonstrated theoretically in our new paper now accepted for publication in JGR that, even if strong negative cloud feedback exists, cloud changes causing temperature change will make it LOOK like positive cloud feedback. And this indeed happens in the real climate system. The only time cloud feedback can be clearly seen in the real climate system is when temperature changes are caused by something other than clouds. And in those cases, we find that the net feedback is strongly negative (around 6 Watts per sq. meter of extra energy lost by the Earth per deg. C of global-average warming). Unfortunately, those events only occur on relatively short climate time scales: 1 month or so. Whether this negative feedback also exists for long-term climate warming is less certain. Do Climate Models Agree With Satellite Observations of Clouds and Temperature? The fact that all the climate models which produce substantial global warming also approximate what we measure from satellites is NOT a validation of the feedbacks in those models. So far, after analyzing thousands of years of climate model runs, I have found no convincing way to validate the climate models’ long-term feedbacks with short-term (approx. 10 years or so) satellite observations. The reason is the same: all models have cloud variations causing temperature variations, which then obscures the feedback we are trying to measure. But there’s another test that could be made. The modelers’ case would be stronger if they could demonstrate that 20 additional climate models, all with various amounts of negative – rather than positive — cloud feedback, are less consistent with our satellite observations than the current crop of models, all of which had positive cloud feedback. I suspect they do not spend much time on that possibility. A climate model that does not produce much climate change is going to have difficult time getting continued funding for its support. Trivia Question to Illustrate the Point: Assume continually increasing CO2 in the atmosphere is the only source of climate variability, and we experience continuous slow warming as a result. Will the outgoing longwave radiation (OLR, or infrared) being emitted by the Earth increase…or decrease…during this process? ANSWER: If warming is the result of increasing CO2 in the atmosphere, then the outgoing longwave radiation (OLR) from the Earth will DECREASE over time. As scientists already know, it is this decrease in OLR that causes the warming in the first place. But because the climate system cannot warm instantly in response (there is a time lag due to the heat capacity of land, ocean, and atmosphere), the increased OLR from warming can never fully make up for the decrease in OLR causing the warming. That warming-induced increase represents the FEEDBACK RESPONSE. But it is forever more than offset by the FORCING from increasing CO2. Now, If we know the time-history of the forcing, it can be subtracted from the OLR to get the feedback. Indeed, this is how feedbacks are diagnosed from climate model experiments involving transient CO2 forcing. The “blunder” I talk about refers to the fact that climate researchers have not accounted for natural sources of radiative forcing (cloud variations) in their attempts to diagnose feedback in the real climate system. Technical Note: We have found from modeling studies that if the natural cloud variations were truly random in time, the error in diagnosed feedback would be random, not biased toward positive feedback, and would average out to near zero in the long term. But in the real climate system, these cloud variations have preferred time scales….in other words, they have some degree of autocorrelation in time. When that happens, there ends up being a bias in the direction of positive feedback.